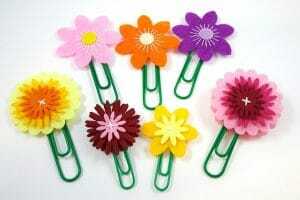 I don’t know about you, but I do love some flower crafts ideas to cheer me up. 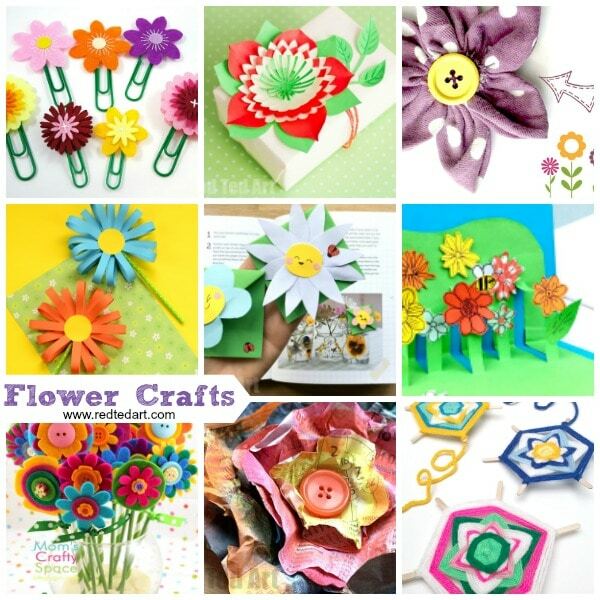 We have a collection of mixed flower crafts for you here today. 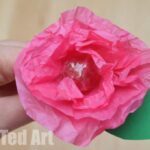 Some are perfect flower crafts for kids to make, others you may like to make FOR them. Flowers are so pretty at ANY time of year – colourful and just lovely. I often feel “guilty” though about having cut flowers (occasionally, I guess that is fine), so I like to surround myself with flower crafts instead! 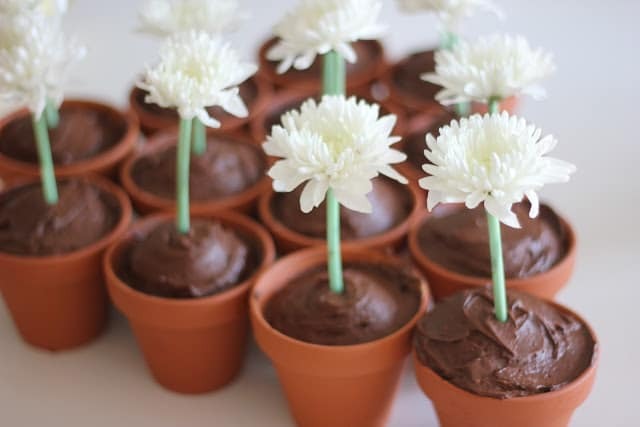 Enjoy these oh so pretty Flower DIYs!! 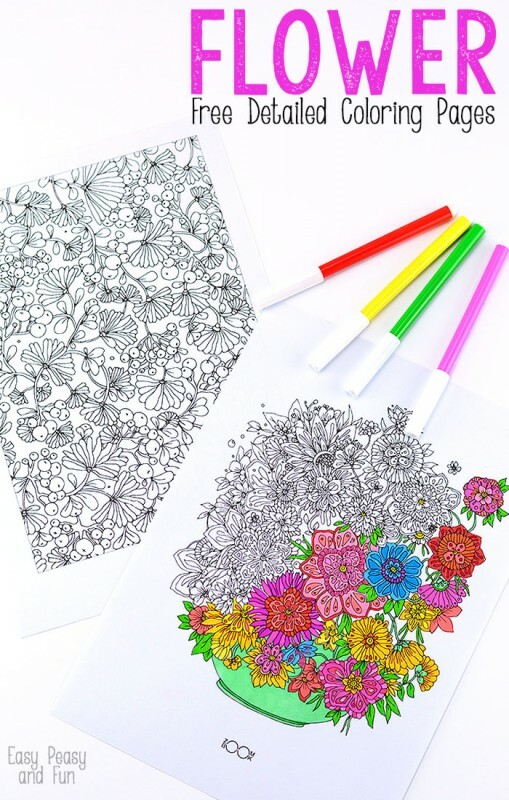 And bring some COLOUR back into your world! 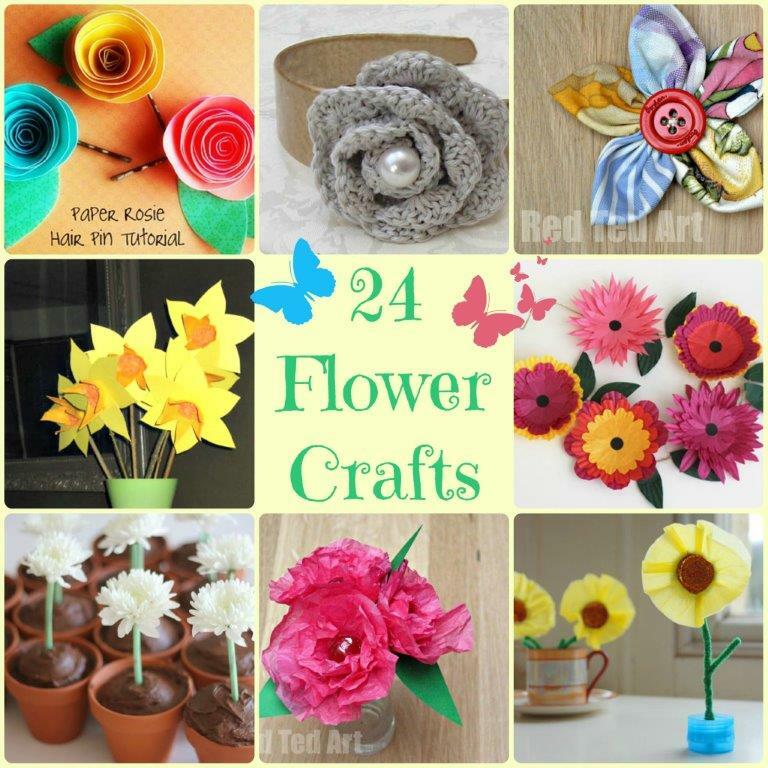 Many of these flower crafts would be suitable for Mother’s Day, for a Summer Party or even as a gift to a friend on Valentine’s Day. 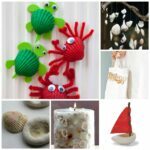 Other’s may suit some Wedding Planning or are “just because” crafts! 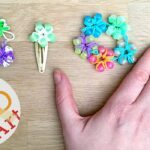 We have split the post into two – some generally linked Flower DIYs and crafts, and then below a “Flower Crafts Hangout” – where we chat about and show our flower crafts to you directly, including additional information links to the flower craft posts!! I hope you find it helpful! 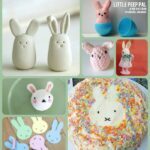 Let’s begin with this super adorable Crochet Flower guest post! 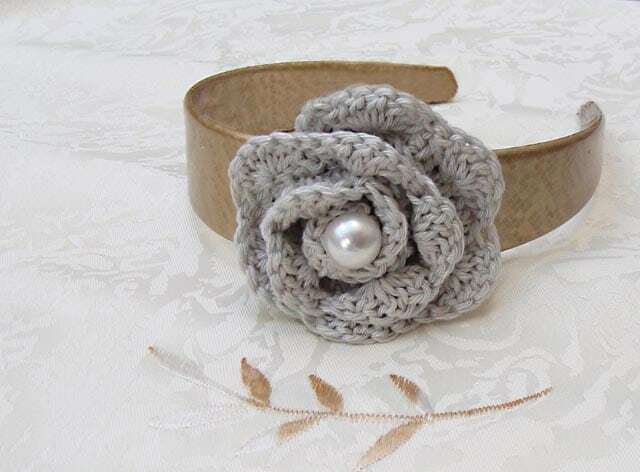 I love how simple this crochet is and how it looks fabulous as a head band or brooch or bag accessory! 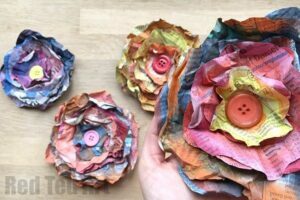 Simply GORGEOUS Newspaper Flowers – such a clever and simple upcycle that looks absolutely fabulous! We also love these 3d Paper Flowers – so easy to make and we have a great Christmas Poinsettia verison too! 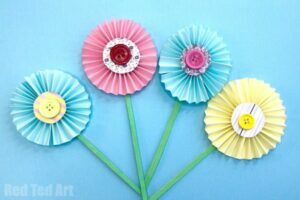 Fun with accordion flowers – how cute are these? 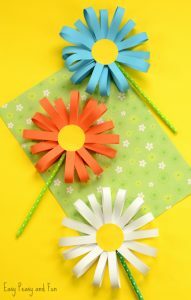 We also adore these Flower Corner Bookmarks, you will see that they are VERY easy to make and look super effective. 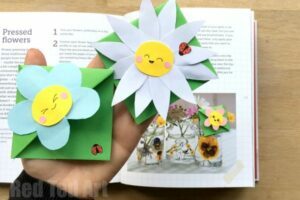 A great little gift for kids to make on Mother’s Day.. or maybe use them as an Easter Corner Bookmark too?! 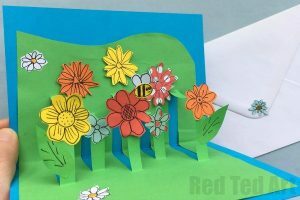 This Pop Up Flower Garden Card is simply delightful. 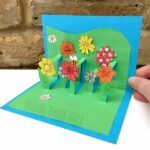 A perfect 3D Flower Card for Mother’s Day don’t you think?! 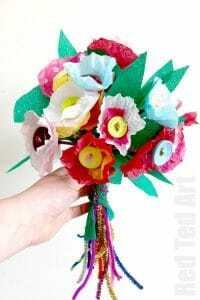 This Tissue Paper flower bouquet was made with a class of 5 and 6yrs olds for their Primary School Teacher’s Wedding! Isn’t it adorable! 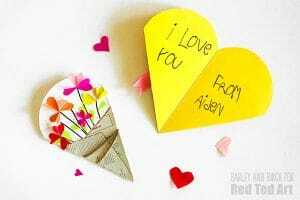 Or how about these super cute heart Flower Heart Bouquet Cards? 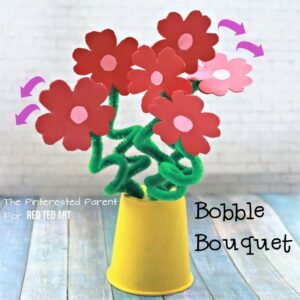 or how about this fun Bobbing Flower Bouquet ? 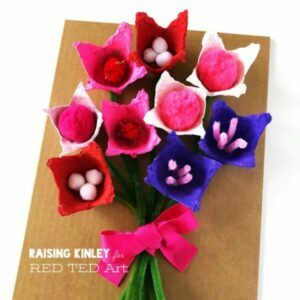 Such a quirky and cute idea for kids to make on Mother’s Day or Valentine’s day!! 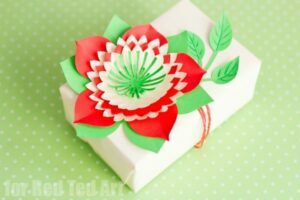 Continuing on the Paper Flower theme – here is another beautiful Paper Flower you can make – perfect for gift decorations and comes complete with a simple printable Flower Template! 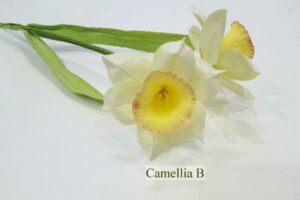 Another one for “Older kids” or teens.. or ahem, grown ups, are these simply STUNNING realistic paper daffodils. Aren they beautiful?! 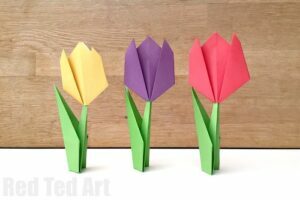 Or how about some realistic paper tulips? Again, perfect for Mother’s Day! 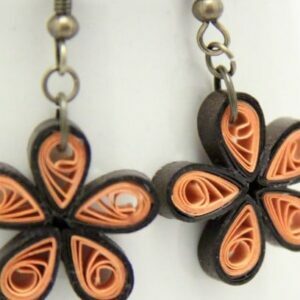 Try your hand at Paper Quilling and have a go at these lovely and oh so simple Quilled Daisy Earring? 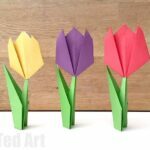 Or something simpler for the kids – we love this fabulous Origami Tulip – a great introduction to origami for kids! 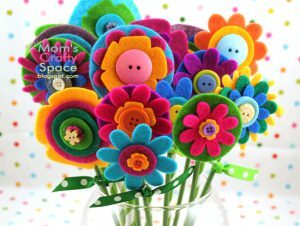 Love how very pretty these Felt Flowers look. Oh I wan to go off and make some straight away! Check out Happiness is Homemade for more info! Oh yes, we do love our Corner Bookmarks (see Flower Bookmarks above), but these little felt paper clip flower bookmarks are adorable too! 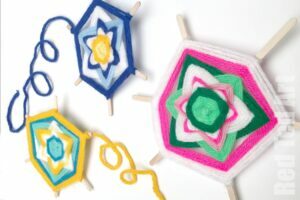 Flower God’s Eyes – it is super quick and easy to learn how to make this oh so pretty pattern! 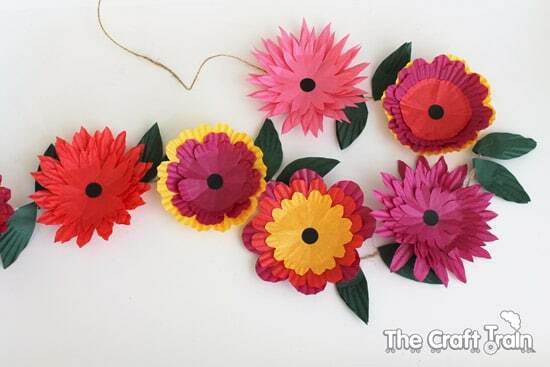 Oh aren’t these Cupcake Case Flowers, turned into a flower garland from the lovely Craft Train simply delightful? 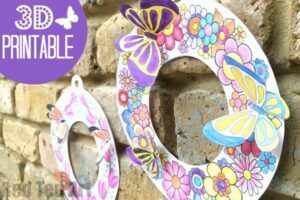 Such a pretty Spring Craft or prefect for Mother’s Day too! 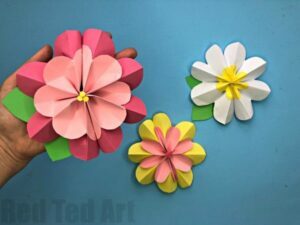 More fun with paper – have a go at these lovely paper flowers and follow the super easy instructions from Easy Peasy and Fun!! 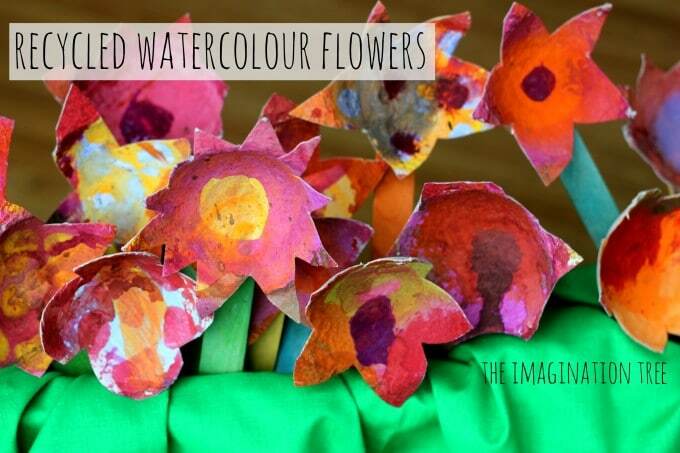 More recycled fun with these cardboard box flowers, also from The Imagination Tree. 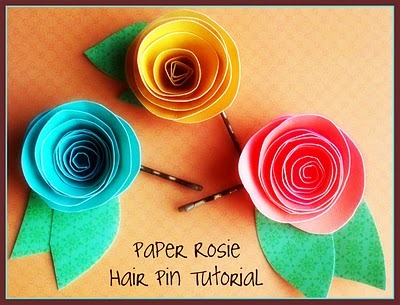 And we do adore these lovely and simple, but oh so effective Paper Roses from Poppy Chic. 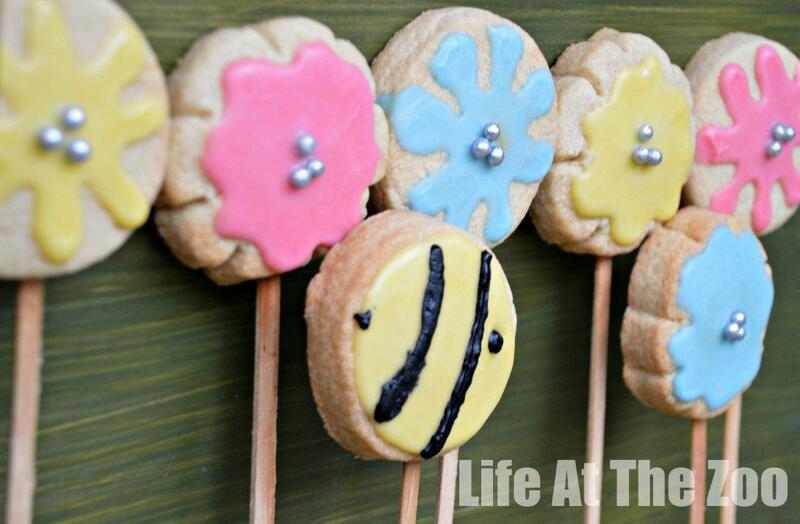 Oh and a cheeky extra.. edible Flower Cookie Pops (a no egg recipe)! 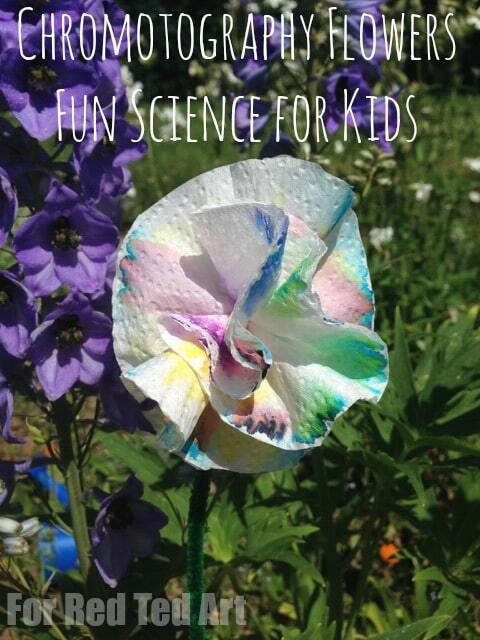 How about these wonderful Chromatography Flower – where Science meets Crafts! 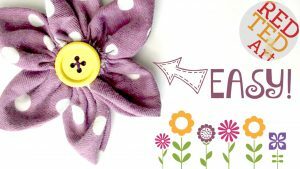 Super simple Flower Pattern – perfect for “beginner sewers“! 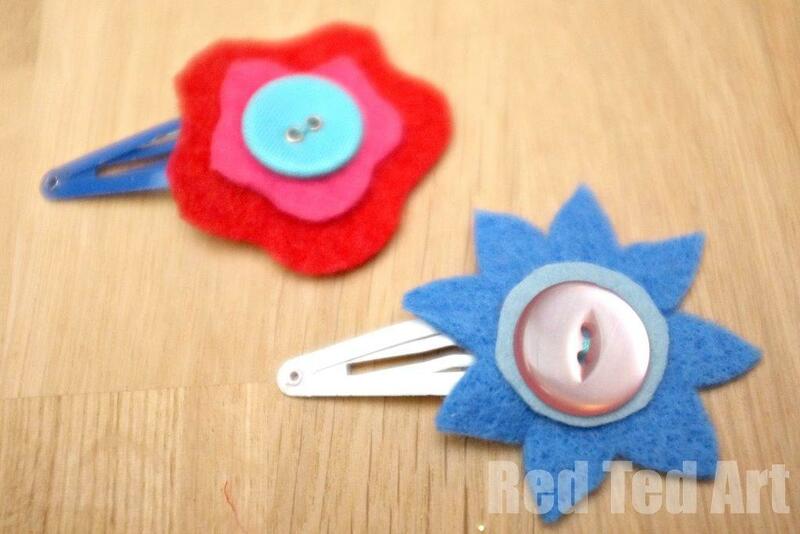 They can easily be worn or turned into rosettes. Love love love. 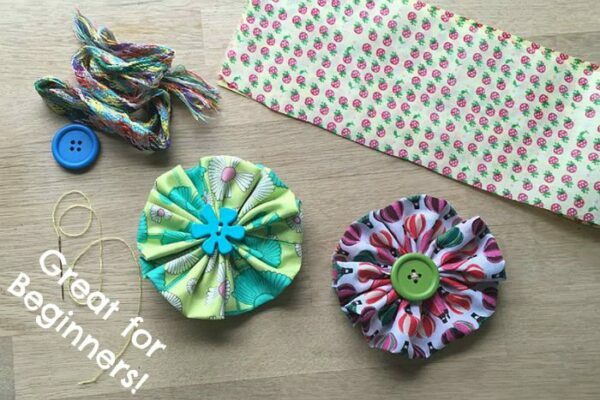 We also have THESE easy pretty flowers to sew – the next level up in sewing skills for kids! 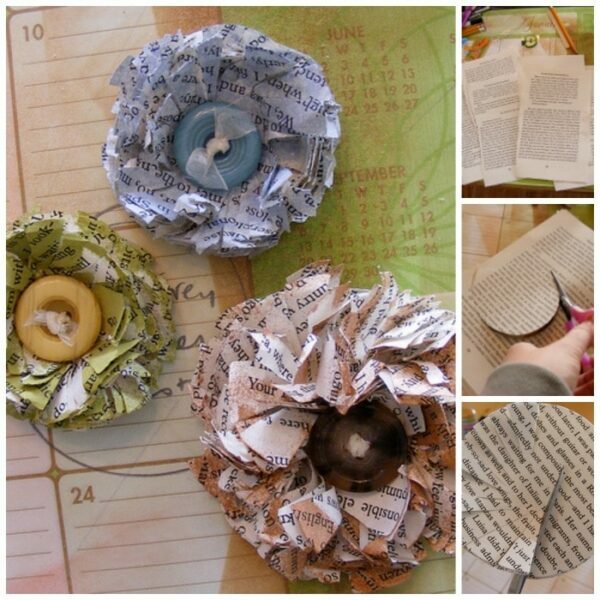 More fun with upcycled Flowers – turn old books into pretty paper flowers! They look great on gift wrap too. 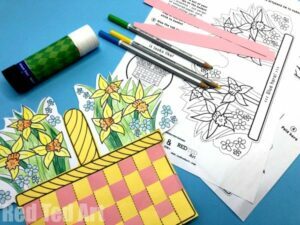 …3D Spring Flower Wreaths Coloring Pages? Aren’t they simply DARLING!? 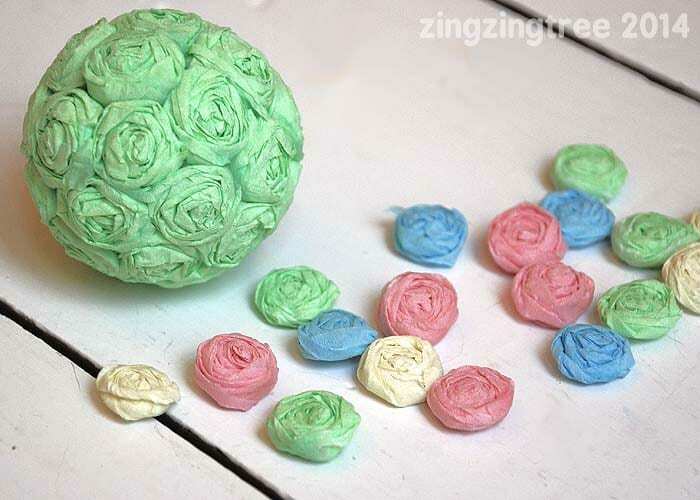 19) Zing Zing Tree also has these AMAZING Crepe Paper Pomander. And she promises a tutorial VERY SOON. In the excitement of the video, she forgot to show it! 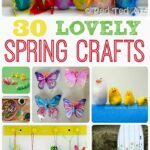 I hope this is a good selection of flower crafts for you – using a variety of materials from fabric, to paper to recycled! What fantastic ideas, thank you so much for sharing them all. I never thought about hairpins – and could make jewellery too. 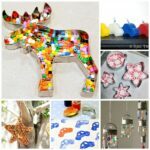 Ooh yes, so many of these crafts make lovely jewellery! My pleasure, it is so pretty!!! These ideas are so nice! 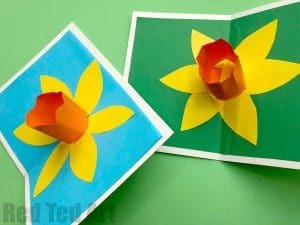 We also just did some super easy to do flowers from egg carton – http://www.outnumbered.be/craft-creativity/crafts-egg-carton-flowers/? 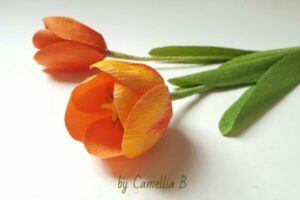 You make such pretty and creative flower crafts. Would you have any ideas on how I could make a tulle flower on a stem that I could put some cloves or potpourri between the layers of tulle? It would be like a sweet smelling rose you could put a bunch of in a vase in your bathroom. I saw it once but I cannot figure out how to make them. I would love your input or anyone else’s. 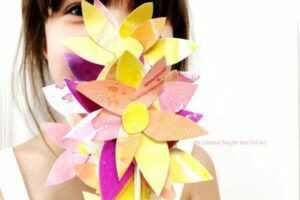 Your flower crafting ideas are really wonderful and creative. Thanks for sharing the such a interesting post.